﻿ In need of barcode labels? Jekashop can help you! 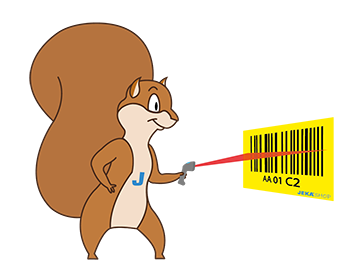 Jeka barcode labels are available for purchase with many barcode types. The main differences between these barcodes: the amount of different characters they can contain, the space between the stripes and the thickness of the stripes. 2/5 interleaved: can only contain numbers (numeric), 0 through 9. Labels with different barcode types, like EAN 128, are available on request. Aside from the (1D) barcodes already mentioned, there are also 2D barcodes. A well-known example is the QR code. These barcodes can contain more data, but are not commonly used in warehouse environments. In the last few years they have emerged in marketing activities, for example, in interactive links to websites. In more and more warehouse environments, like the automotive and pharmaceutical industries, 2D barcodes are commonly used. With these, an order picker gathers the appropriate products and registers a batch or serial number. Our barcode labels also come with 2D barcodes, such as DataMatrix or Aztec, on request. All our labels are laminated, in contrast to labels made by competitors. A transparent top layer assures an excellent protection of the print preventing any dirt to affect the label, which guarantees a long lifetime. The labels can be used indoors as well as outdoors. Self-adhesive labels have a strong permanent adhesive layer and adhere to any smooth, flat and fat-free surface. Loka Premium: a hardy printed label with a powerful adhesive layer. This label is compatible with every flat surface. The premium label is compatible with all common rack types. Loka Lite: universal, flexible label. This label is compatible with every surface. Loka Lite is designed to be used in locations where minimal damage is expected, such as shelves. Loka Long Distance: with this label an additional retro-reflecting inner layer is used. This label is designed for use where scan distances are long, or when lighting conditions are not optimal. Loka long distance is a hardy printed label with a powerful adhesive layer. All our labels are also available with a magnetic back layer. Magnetic labels have a magnetic base, which enables a connection to metal rack beams. They can easily be attached, removed and repositioned again and again. Magnetic Loka 's are ideal to use in cold stores and freezing chambers, since the low temperatures have a positive impact on the adhesion of the magnetic Loka. Standard background colors are yellow or white. The text is always printed in black. Other available colors include red, green, orange and blue. In addition to location numbers the labels can also be printed with other text, such as article codes or names. Loka 's can be produced in several standard character heights with corresponding label heights. The character height should be in accordance with the maximum reading distance desired. Because people will always read plain text first, the most obvious location for the barcode is behind or beneath the text. Nowadays, barcode technology is no complicated matter anymore. Naturally, Jeka would gladly advise you. Years of experience guarantee a complete and specific advice from our team. Questions about our barcode labels? Don’t hesitate to contact one of our sales advisors.